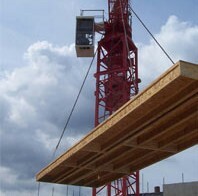 Oregon prefabricates floor cassettes and erects them on site using a crane. This prevents un-safe working from height and lifting injuries during erection. Once installed, the floor cassette provides a safe working platform for the erection of subsequent floors. Oregon’s floor cassettes can also deliver optimal performance in strength and acoustic values, using details developed over the years and backed by independent laboratory testing.